St. Agnes Cemetery is a 108 acre Catholic cemetery located in Menands, NY. Founded in 1867, it is an example of the rural cemetery movement full of winding paths, magnificent vistas, beautiful sculptures and historic monuments. The cemetery provides an open space for quiet walks and public enjoyment of nature, history and art. 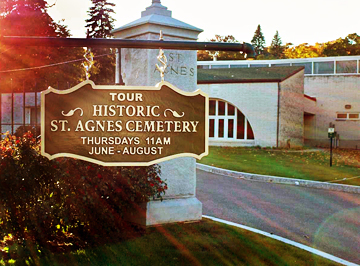 St. Agnes, today, is one of the Capital Region’s most active cemeteries. Community involvement with the cemetery is encouraged through historic tours, bird watching events, veterans’ ceremonies, school field trips and genealogy research. The current on-going Founders’ Hill Restoration Project is a multi year effort undertaken by St. Agnes Cemetery to restore and preserve the landscape, monuments, and historic records associated with burials dating back to 1868. In the area of preservation of records, St. Agnes Cemetery has partnered with the Troy Irish Genealogy Society to assist in scanning and transcribing the fragile cemetery interment books. Each interment index will then be available for review on the Troy Irish Genealogy website. The on-line index of these interments will show the name, date of death and age of the individual. Genealogy and family researchers will then be able to request additional information on their family members which may be available in the St. Agnes Cemetery records. 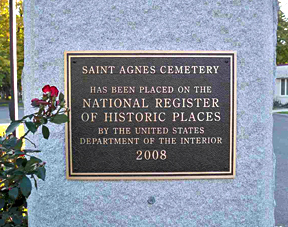 Copies of additional information in the cemetery records that may be of interest to genealogy and family researchers can be ordered from the St. Agnes Cemetery Office for a fee of $5.00. The additional information, which may be available, will vary depending upon the individual interment book. Austen Fadden – Knoxville, Tenn.
Linda Christian-Herot – Newton, Mass. Bob McConihe – Haverhill, Mass. Eileen Werth – Plymouth Meeting, Pa.